Commandos gazing upon the view. Anyone who knows me well knows I have a special fondness in my heart for those who serve in the military. I support our troops despite what FOX news relays to us and I realize that each person who serves is doing something spectacular. I am thankful for them every day. 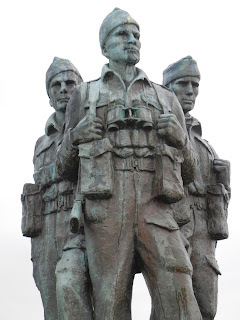 On the way to Glengarry Castle we passed by the Commando Memorial. From our little two lane road it was simply a large statue with a pullout nearby and no real markers telling us what it was. I whipped the car into the parking area (and gave Jen whiplash) as three buses and big trucks of military men were loading up, leaving the area. (Oh, by the way, those "men" were kids, I must be getting old.) The memorial is dedicated to all commandos who had lost their lives in service of their country from 1939-1945 and others who sacrificed after. The large statue overlooks some of the most beautiful country side. Even with the fog and darkness approaching, it was a sight to behold. Although the large statue was impressive, the makeshift memorial for the more recent soldiers/commandos grabbed my heart strings and made me reflect upon my friends, loves, and life. Here are a few photos from that memorial, which sits with only a view of the parking lot but seems ever so much more important. I thank the soldiers for their service, far and wide. May Angel watch over them.